Gatton Park passed through several hands between the date of Sir George’s departure in 1774 and 1888, when Jeremiah Colman, of the East Anglian Colman’s Mustard family, purchased the estate. He invested a fortune in the restoration of the house and grounds, and, by the time he had completed the transformation, Gatton Hall was a stunning prize to possess. Like Sir George Colebrook, Jeremiah Colman was also a keen horticulturalist. He had a particular interest in orchids and carnations, and found ample opportunity to indulge his passion in his new property. He engaged H E Milner to remodel his gardens and supervise the designs. 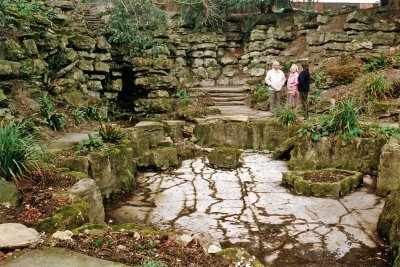 As mentioned in Rock Landscapes – The Pulham Legacy, the Pulhams had already worked with H E Milner’s father, Edward Milner, in the Swiss Garden, at Old Warden, in 1876 – Chapter 10 – and on the design and construction of Holly Hill Park, in Fareham, Hampshire, during the early 1880s, as discussed in Chapter 13. H E Milner is thought to have been involved with his father in that project, as well as being responsible for the design of the rock garden at Gisselfeld, in Denmark – discussed in the May 2012 edition of Site of the Month – which is one of the only places outside the British Isles in which the Pulhams are known to have worked. It seems that the Milners liked to keep things in the family, because H E Milner brought in his son-in-law, Ernest White – who designed the gardens at Ardross Castle (see the December 2011 edition of Site of the Month); the RHS Garden Wisley, and the Stoke Poges Memorial Garden (discussed in Chapter 35 and 42 respectively in the book) – to collaborate with his work at Gatton. Between them, they decided to divide the gardens into sections, and create a Japanese garden, an Italian garden; a rose garden; an Herbaceous section, several water features, and a rock garden for which they engaged James 3. [iii] It was initially assumed that the Pulhams’ involvement here was restricted to the rock garden, but, bearing in mind the more formal work they are known to have done elsewhere around this time, there is little reason to assume that they had no association with the rest of the gardens at Gatton. He then quotes Reginald Farrer, the eminent explorer and plant hunter of the early 20th century, who even went so far as to characterize such constructions as ‘almond pudding’ and ‘plum bun’ systems, so I was quite keen to go and see it for myself. This rock garden is built into a steep, wooded bank just below the main house, and, as can be seen from Fig 1, it consists of a vast cliff of ‘rocks’ nestled into a clearing, at the front of which is an artificial pool. The pool was empty at the time of my visit, because its Pulhamite lining had sprung a leak, and was in need of repair. There are other Pulham signatures here, too – it has planting pockets around the rim; a paved surround, and rusticated steps leading up to the small terrace at the foot of the rock cliffs. One cannot deny that the rockwork itself was in quite a sad state of repair at the time this picture was taken – especially on the left-hand side. The cliff had partly collapsed, and some of the rocks had been completely displaced – some are indeed standing on end, and are presumably what Brent Elliott was writing about – but I understand that this has now been restored, so all is far from lost. The rocks here have not been stratified in quite the same ‘naturalistic’ way that can be seen in the majority of Pulhams’ work, in that they do not incorporate a natural geological ‘flow’. One also has to admit that there is hardly any stratifying mortar between the ‘rocks’, which themselves almost look as if they have indeed been stacked in a sort of columnar formation. Whatever the origins and reasons for this construction may have been, however, this garden – which was built c.1912 – was a very popular and peaceful retreat for the Colman family and their guests. One such guest was Queen Mary, who often enjoyed relaxing in a seat below the cliff face, from where she could look down, past the cascade and the pool, and over the park beyond. This article also included two photographs of the original garden, the first of which showed a ‘stone Japanese lantern’ in the foreground, placed near the still waters of the stream. This reinforces the feeling that this might well have been Pulham’s work, because their usual method of working was to send one or two craftsmen ‘rock builders’ to a site, whose first responsibility was to employ a team of workers from the local unemployed to undertake the heavy manual work. ‘Water tumbling over ragged rocks into the deep pools, whence it winds its way to other falls and pools’ is also a very evocative description of a typical Pulham landscape. When the Channel 4 television team got to Gatton, the Japanese Garden was completely overgrown after many years of neglect, and a lot of work was needed to restore it. They managed to get some replica lanterns made, and one of them is shown in the foreground of Fig 2, which was taken at the time of my visit about a year or so later. This indicates that the original may well have come out of the Pulham Manufactory, as can be seen if one compares the lantern in this picture with their Okayama lantern, shown in Fig 33.1 in the book. The hut, or ‘tea house’, is a very rough and simple, open-sided structure, with a light roof supported on a wooden frame, and there is also a rustic wooden bridge – not shown here. As discussed In Chapters 32 and 33 of Rock Landscapes, one of the nurseries run by John and Henry Veitch was located at Coombe Wood, Kingston-upon-Thames, on a tongue of leasehold land that was owned by Sir Arthur Paget, of Warren House. It was mainly devoted to the display of Japanese flowering trees and shrubs, although their lease terminated in 1913, and Sir Arthur absorbed the nursery land into his Warren House estate. It must be significant that, c.1911-15 – very soon after the construction of the Japanese garden at Gatton – James Pulham and Son were engaged to landscape the Veitch nursery site into one of the most wonderful Japanese Gardens that still survive in pristine condition today at what is now called ‘The Watergardens’. 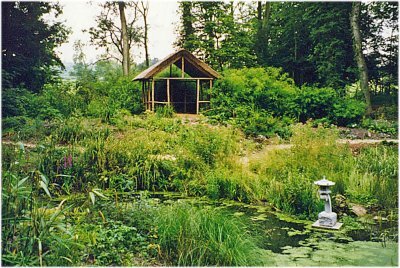 It was also around this time that James 3 helped to create the Japanese Garden at ‘The Node’, in Codicote, Hertfordshire – discussed in Chapter 34 of the book. There can therefore be little doubt that the Pulhams were involved with the Japanese Garden at Gatton, and it is also very likely that they were responsible for the Italian Garden, and most of the other landscaping that took place around this time. The Italian Gardens at Warren House and Danesfield House – described in Chapters 32 and 28 respectively – are excellent examples of their work in this style. A severe fire destroyed much of the hall and its art collection in 1934, and Sir Jeremiah – as he was by this time – began rebuilding immediately. It was not a complete restoration project this time, however, because he redesigned the hall for its eventual use as an institution. Following his death in 1942, part of the estate was taken over by the Armed Services until the end of the Second World War, and the gardens fell into neglect once again. Eventually, in 1948, the hall, and some 250 acres of the estate, were sold to the present owners, the Royal Alexandra and Albert School, where the staff and pupils are working very hard to maintain and restore the gardens as far as possible to their former glory. Posted on June 1, 2012 June 4, 2016 by Claude HitchingPosted in Sites Month 2Tagged . . James Pulham and Son, Gatton Park, H E Milner, Henry Veitch, japanese garden, Jeremiah Colman, rock garden, watergardens.